A Familiar Favorite: Fresco Italian Café ages like fine wine. I still vividly remember my first foray to Fresco Italian Café, a millennium ago, back when Lane Pellinger was the chef and David Harries still owned the restaurant. Back then, Fresco was one of the first Utah restaurants to boldly offer risotto—reminding me of the film Big Night—when many customers came in looking for spaghetti and meatballs. Through the years, a spate of chefs has come and gone, and menus have varied wildly. But there’s something about this place that is unchangeable and unstoppable, regardless of who is doing the cooking. In recent years Fresco’s stability, I believe, has come from owner Mikel Trapp. Along with Fresco, Trapp owns the Trio restaurants in Cottonwood and downtown. I’ve been told that he’s not always easy to work for. And, I suspect that Trapp is demanding (what successful restaurateurs aren’t?) because he is, first and foremost, a chef. It’s easy to forget that Trapp once was the chef at Stein Eriksen Lodge, as well as at the home of Salt Lake City’s “handcrafted American cuisine,” the Metropolitan. Before becoming a restaurant owner, he also served as Snowbird’s director of food and beverage, overseeing its 13 eating establishments. He’s also quietly involved in numerous local charities. So, no: Trapp doesn’t suffer fools gladly. As a diner, I’m thankful for Trapp’s quest for perfection; Fresco is one of the few restaurants that I recommend to visitors and friends without hesitation. It’s virtually impossible to have a bad meal there, although, as I always advise, your mileage may vary. I know it’s impossible to get lousy service at Fresco. Trapp has surrounded himself with a polished staff that includes top-notch veterans like Bobbi, Esther, Alex, Richard, Brittany and Johanna, to name a few. I don’t recall ever encountering even the slightest service glitch dining at Fresco. That includes a couple of recent visits where the beautiful, shaded courtyard patio is difficult to resist, even in the steamiest weather. And, the patio offers a quieter option for customers who don’t like the sometimes noisy indoor dining room. Fresco is a small space, and one loud table can elevate the volume of the entire restaurant. Trapp thought briefly about putting in baffling or half-walls and the like to diffuse the noise, but ultimately decided, “It is what it is.” Frankly, I love Fresco exactly the way it is, and wouldn’t change a thing. So, indoors or out, it’s pleasing to kick off with a glass of fizzy Prosecco or a signature cocktail like a Bellini, ginger martini or High West Manhattan and a starter from the antipasti menu: seared polenta with sautéed wild mushrooms, Fontina cheese and pomodoro sauce ($9) perhaps, or the addictive bruschetta ($10) with garbanzo puree, tomato confit, bresaola, ricotta salata, arugula and lemon vinaigrette. Occasionally, such as during a recent wine tasting event showcasing Vietti wines—when Trapp himself was in the kitchen—you might be lucky enough to be offered homemade mini-agnolotti, which are dreamy. If not, be sure to order the standard portion: agnolotti pasta made in-house and stuffed with spinach, fresh ricotta, roasted garlic, wilted greens and roasted chicken ($23). It’s simply one of the most delicious pasta dishes you’ll likely ever encounter. Other pasta/rice dishes at Fresco include a nightly risotto, the ingredients of which varies frequently; in spring you might find creamy risotto with fresh English peas and lobster, while in the fall, black or white truffles will find their way into your dish. And, I can assuredly recommend farfalle ai gamberi e vongole, which is the restaurant’s take on spaghetti with clam sauce. 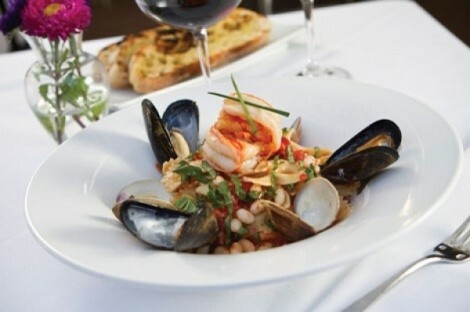 Only, in this case, the pasta is bow-tie farfalle pasta bathed in a silky tomato-pancetta-white bean broth and served with steamed clams and mussels and sautéed jumbo prawns ($23). A lighter pasta offering, probably better suited to summer’s toasty weather, is a simple but sensational linguine primavera ($22) made with a mélange of fresh local and organic vegetables, which varies depending on what’s available to the chef that day. Fresco has taken chicken piccata ($24) and revved it up a bit by stuffing the white meat chicken with asparagus and Fontina cheese and serving it with spinach, orzo pasta and a zippy lemon-caper-garlic sauce. It’s a dish that pairs well with a glass ($8) of Alois Lageder Chardonnay from Alto Adige in Italy, which has enough acidity to stand up to the lemon and capers and enough body to hold its own with the tender chicken and cheese. The wine list at Fresco is adventurous, if not massive—there’s only a very small space to store wine in the restaurant’s cozy quarters—and I’m grateful when I dine there that the prices don’t gouge. Even at the high end of the wine list, a bottle of Dom Pérignon Brut, Hautvillers 2000 is only $200. I’ve seen it at restaurants almost double that price. At the opposite end of the spectrum, there are many very good wines available in the $25 to $35 range. I like that Fresco seems to be going through a “back to basics” stage, including some modern menu twists on classic dishes such as chicken piccata, pasta primavera and the like. The cooking cornerstone at Fresco seems not so much about a “wow” factor, but more about the use of really good, fresh, high-quality ingredients such as Niman Ranch pork tenderloin, Morgan Valley lamb, cheeses from Shepherd’s Farm, Maytag Dairy Farm and others, Crumb Bros. breads, sausages and salamis from Creminelli, Bell Organic Gardens’ produce and so on. In a sense, everything old is new again: Fresco, situated in an old, beautiful house, is aging like fine wine. But, it’s also keeping up with the times—and simultaneously going retro—by valuing first-class ingredients and then letting them sing. Try it; you’ll like it.